The shrine of the Gods is a place to meet with them. A site of devotion, to gather oneself and meet ourself in the shine of the light of the Gods. The Gods are close to us and they are always with us wherever we are. We are the ones who need a center and this one is always open. It is for us a reminder to pause for a moment , to catch one`s breath and gather new strength. The lighting of the candle can be this. It is a possibility for a personal reverence, but as well a place to meet people from all over the world, who are close to the Gods. To see the candles of the others and to experience how many we are. All the candles from us gather into one flame, that let the light of the Gods shine bright. This is the idea of the Asatru Ring to bring people together, who are close to the Gods. As the strength of the Gods grows out of there community. Many of us have a corner or shrine of the Gods at home, a card of the Gods in our purse, a Band of the Gods to grip for the Gods. So the shrines are one more invition to get in touch with the Gods. The shrines are aimed the the one´s who come new to the Gods and to make the first experiences. But even for seasoned Asatru it opens new possibilities to get closer to the Gods, which they weren´t close by now. They are a big family and we as there children live a life long with them and get to know them more and more. We ashare our live with the Gods. 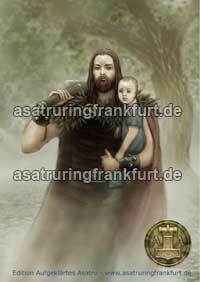 Some Asatru, out of various reasons, have no shrine of there own at home or they can´t reach it as they are on travel. This is one possibility to keep the connection to the Gods. What do I do at a Shrine of the Gods? One can light a candle and leave a few words, a thank, a request, a prayer. Over the next 14 days the candle burns slowly down and a symbol of the Gods appears. So one can coem anew before the Gods and light a new candle. Be welcome and share some words coming from the heart.